SecureVideo - VSee: How do I change the size and placement of my video tiles? VSee: How do I change the size and placement of my video tiles? Here are instructions and tips to resize and adjust placement of your video tiles during your videoconference, for Windows and Mac computers. Unfortunately, video tile sizes and placements cannot be adjusted on mobile devices. 1. Hover your mouse over your own video tile (e.g., your image). Tile Along Top: Select this option (or use the keyboard shortcut) to make all video tiles align along the top of your screen. Tile Along Left: Select this option (or use the keyboard shortcut) to make all video tiles align along the left-hand side of your screen. Tile Along Right: Select this option (or use the keyboard shortcut) to make all video tiles align along the right-hand side of your screen. Tile Along Bottom: Select this option (or use the keyboard shortcut) to make all video tiles align along the bottom of your screen. 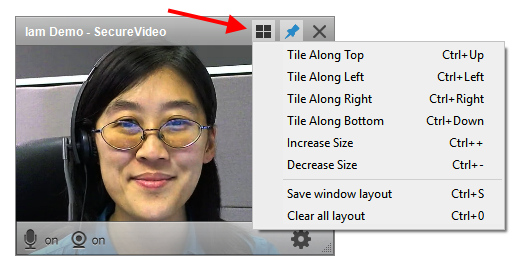 Increase Size: Select this option (or use the keyboard shortcut) to make the video tile larger. Decrease Size: Select this option (or use the keyboard shortcut) to make the video tile smaller. Clear all layout: Select this option (or use the keyboard shortcut) to delete a saved setting for the placement and size of video tiles. You can also hover over the lower right-hand corner of the video tile (there's a light cluster of dots there) until your cursor changes to a double-headed arrow, and drag the corner of the video tile to your desired size. TIP: Click on the push-pin icon (upper-right hand corner) to pin the video tile to your screen if you want it to be visible on top of all windows (this will also cause it to appear as a black square if placed on top of a shared window). You can tell the window in the image above has been pinned because the pushpin icon is blue. Minimize: Select this option (or use the keyboard shortcut) to minimize all your video tiles. Zoom: Select this option (or use the keyboard shortcut) to maximize all your video tiles. Bring All to Front: Select this option (or use the keyboard shortcut) to make all your video tiles appear. Tile Along Top: Select this option (or use the keyboard shortcut) to make all your video tiles align along the top of the screen. Tile Along Left: Select this option (or use the keyboard shortcut) to make all your video tiles align along the left-hand side of your screen. 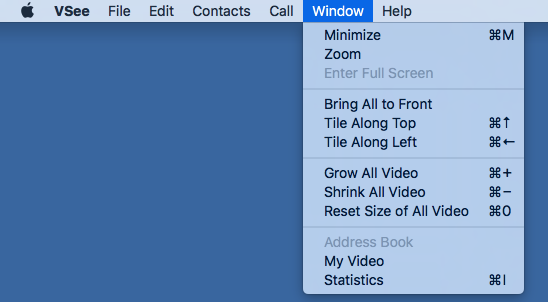 Grow All Video: Select this option (or use the keyboard shortcut) to make all your video tiles larger. Shrink All Video: Select this option (or use the keyboard shortcut) to make all your video tiles smaller. Reset Size of All Video: Select this option (or use the keyboard shortcut) to make all your video tiles revert to their default size. 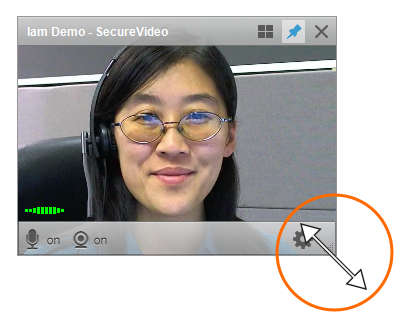 [Name] - SecureVideo: In this example, the other person in this session was called "Iam Demo". All of your participants' names should appear at the end of this drop-down menu, and you can bring their particular video tile to the front of your screen by clicking on their name. TIP: In the upper left-hand corner, you can also use the yellow button to minimize the tile, or the green button to maximize it. However, do not use the red button to end a call, as it may not close the call properly. See our support article on ending a videoconference session. You can also click on the push-pin icon (upper-right hand corner) to pin the video tile to your screen if you want it to be visible on top of all windows (this will also cause it to appear as a black square if placed on top of a shared window). You can tell the window in the below image above has been pinned because the background behind it is dark gray. This article was last reviewed by our Support team on April 29, 2016.